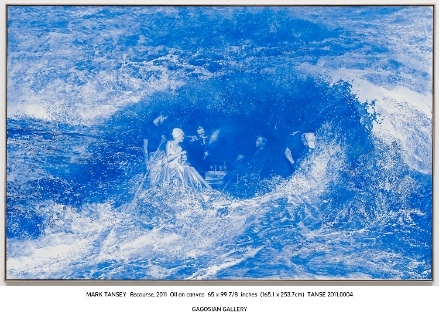 Painter Mark Tansey shows recent work at the Gagosian Gallery Beverly Hills through May 27th. Known for his monochromatic composite figurative paintings, Tansey has chosen works done in ultramarine to display in the gallery. His work is well known for crossing the boundaries of illustration and perception- works seem to depict single narratives or settings, but when given a second look, the figures begin to separate from one another and an assortment of new narratives form on the canvas. Within in the works on display, Tansey plays with ambiguity, inserting his own ideas into what appear to be well-known situations. The ultramarine color leads to comparisons to blueprints—guidelines for composition. 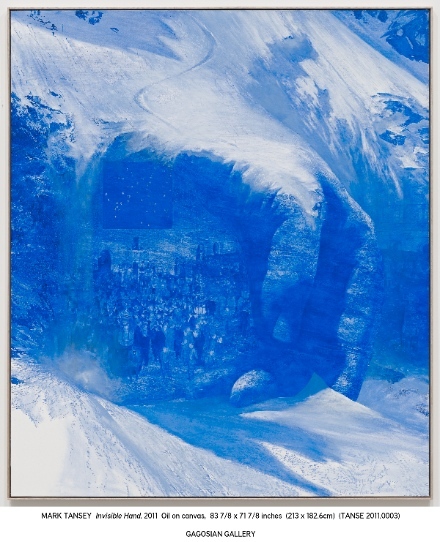 The objects and locations within his paintings, such as a crowd of people or an icy mountain, are things we have seen before, but Tansey quietly distorts them. A second look at “Invisible Hand” shows a hand emerging from a snow bank, either sheltering the crowd or ushering them into the blizzard. The result is an experience of recognition and conflict—what is the event that is taking place? The paintings also appear to reflect on the current social climate; in “Recourse”, an elegant dinner-date takes place in the eye of a storm, with two men dressed as maintenance workers tending the water, keeping it away from the privileged couple. One man holds a rake, the other hedge pruners—odd tools to use in a storm. This scene comments on social differences as well as notions of obsession with celebrity and wealth. 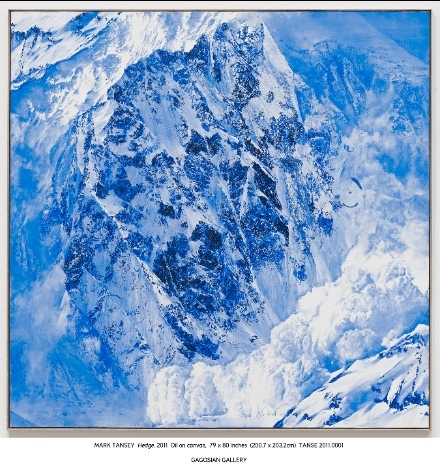 Tansey’s background in art history helps to shape his techniques and subject matter. His methods involve painting from a vast collection of images he has gathered over the years. Taken from magazines and newspapers, they represent the images that have shaped and defined culture. Tansey first creates a collage that serves as a study for painting, altering the images during the process. His work has been described as scientific and photo-realistic. Even when working in one color, Tansey is able to evoke light and dark and add depth to his settings. Recent work, also painted in the same shade, was shown at the Gagosian Gallery in London this past winter. 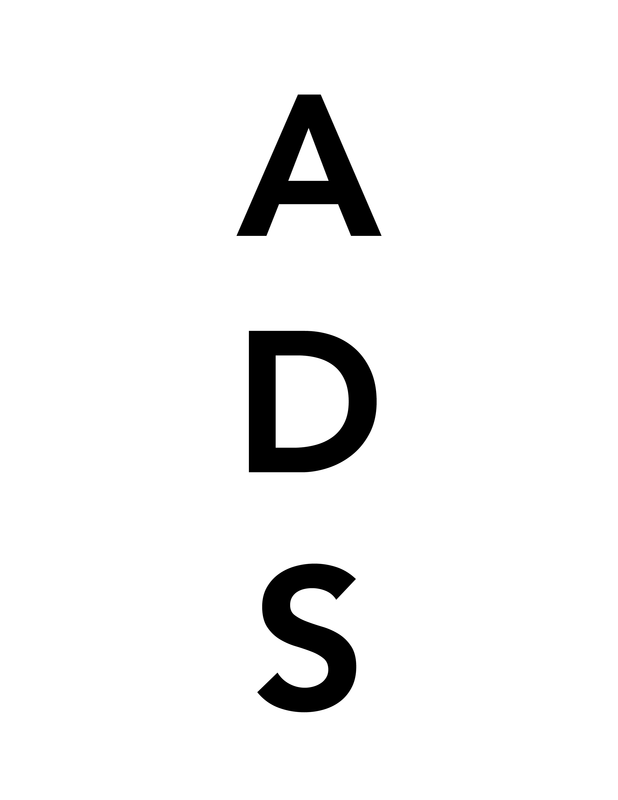 This entry was posted on Saturday, April 30th, 2011 at 10:24 pm	and is filed under Go See. You can follow any responses to this entry through the RSS 2.0 feed. You can leave a response, or trackback from your own site.